Summer is coming up fast, and once the kids are out of school all bets are off. Last year we ended up taking a break in posting most of the summer, but I promise we are not going to do that again this year. However, I want to warn you guys that we are probably going to slow the posting pace down…just a little bit. So don’t worry if you don’t hear from us 3 times a week like you did all spring! We are still here, still writing, still posting, and here is the good news – we are also getting a head start on a bunch of Halloween Costume posts. We are also working our way through the last handful of the first batch of Star Wars patterns. Today we have the character with one of the coolest name in the Star Wars universe (second only to Han Solo) Grand Moff Wilhuff Tarkin. 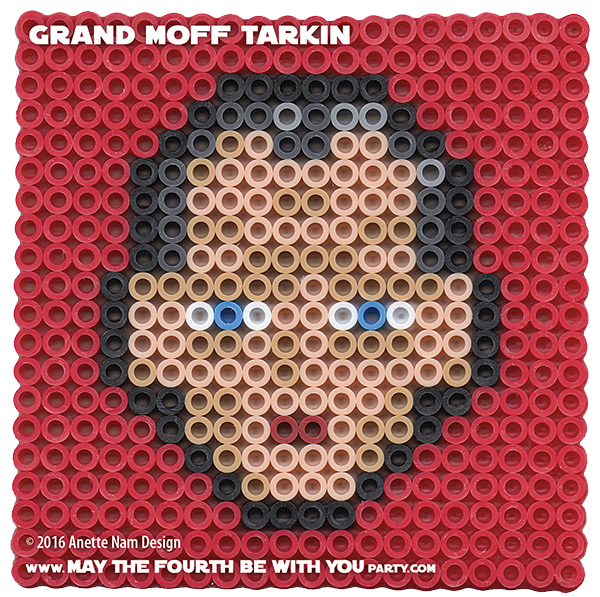 It is worth repeating: Grand Moff Wilhuff Tarkin, #57 in the Perler bead/cross stitch/crochet/knitting/Lego/pixel/mosaic pattern series.